As an historically slow adopter of digital tech, the construction industry is going through a digital revolution. According to StartupAUS, there is unprecedented activity and investment (an estimated $98+ million since the start of 2016) in the Australian construction tech start-up space and they suggest full-scale digitisation in the Australian construction sector could add value in the order of “$25 billion year on year within the next decade”. Despite this growth, many of the construction contractors I meet say they capture time in largely ad hoc, manual, paper or spreadsheet-based methods. This increases admin costs and makes timely, data-driven decision-making near impossible. Fortunately, there is growing demand from construction execs for digital solutions to this problem so they can reduce admin burden and make fast, informed decisions, in-the-field, to keep projects on track and profitable. The prize is worth it. One project team, using Envision, reduced their timesheet administrators from eight to two, and reduced the cost data lag from six weeks (or more) to just a couple of days. You can read the case study here. For CFOs and other executive stakeholders, the project and business value that can be derived from digitising construction timesheets is immense. We’ve covered some fundamentals on construction timesheet considerations here. 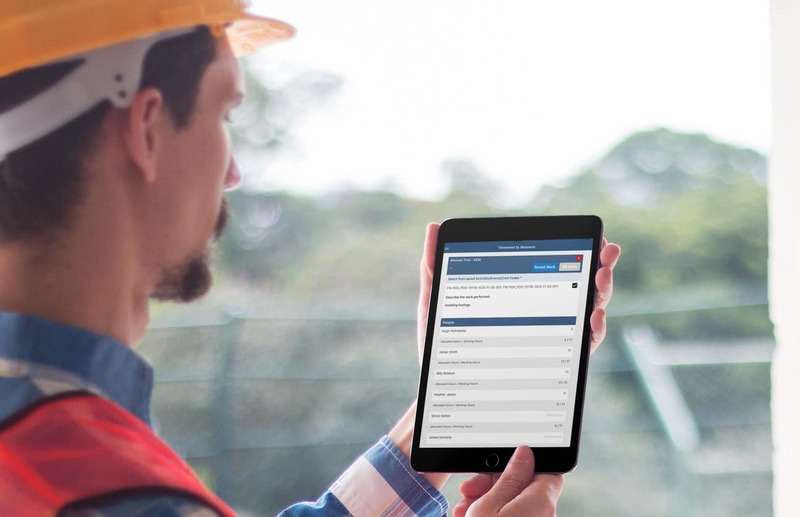 Going further, there are key considerations we’ve learned over several years that can help you realise the full benefits available from digitising your construction timesheets. With your process and people considerations set, it comes down to selecting the right solution. Naturally, we believe Envision has the flexibility, scope and track record to support effectively any construction team. That being said, there are four considerations relevant to any quality solution. The pace of technology change continues to accelerate. Where possible, choose a technology platform that has the flexibility to grow and change with your business needs. Cloud and Software as a Service (SaaS) technologies are becoming very popular and well accepted. These are typically modern, very flexible and very user-friendly. They can get you a 90% fit-for-purpose solution far more cost-effectively than traditional ERP platforms that might get you the extra 10% but are configuration-heavy, time-consuming and expensive. No solution can afford to work in a silo these days. Creating value in an organisation demands a flow of information across an organisation between teams and departments…not locking information into silos. Ken Panitz from CIMIC Group’s EIC Activities sums it up from his panel talk at the recent CTS2017. Ken’s strong belief is that technology providers should build their integration capability (API) first, rather than provide a siloed solution. A great digital construction timesheet solution should be like a lego block within your wider technology strategy, able to integrate with other business systems. A solution with longevity will have an active roadmap and ongoing development strategy to ensure changing business and industry needs are met. Keeping any technology solution secure and working across various mobile devices and web browser platforms requires significant development effort – even before improving its functionality. Select a partner committed to proactive, continual development in response to your business needs and industry trends. Software is just part of the solution. Select a solution that will be well-supported by your chosen vendor, their partners or your internal business experts. Project set-ups and ongoing operational support often require scoping to meet project needs. On-site training as well as remote training documentation, videos and help guides are all key to ensuring adoption. Be wary of solutions that are not properly resourced with a team of appropriately-skilled people who can support rollouts across your business and projects. Software development is extremely iterative. Strong solutions take many evolutions and require wide exposure to different projects and businesses. This is time-consuming, expensive and very hard to achieve in-house. There is significant value – cost and time savings, faster decision-making, better issues management and more – available to companies that digitise their construction timesheets. Please get in touch with us if you’d like to discuss where you’re at today, what you want to achieve, and how we can help your digital transformation with certainty.